Going at it will be the featherweight and lightweight champions, Patricio ‘Pitbull’ Freire and Michael Chandler. Both of which are two of the most accomplished fighters in Bellator history. Factually, they are the most accomplished in their respective divisions. Brazil’s Pitbull will be coming up in weight as he looks to become Bellator’s second double champ behind Ryan Bader. As for his opponent in Chandler, who his older brother, Patricky has become quite familiar with, Patricio doesn’t believe he’s a clean athlete. 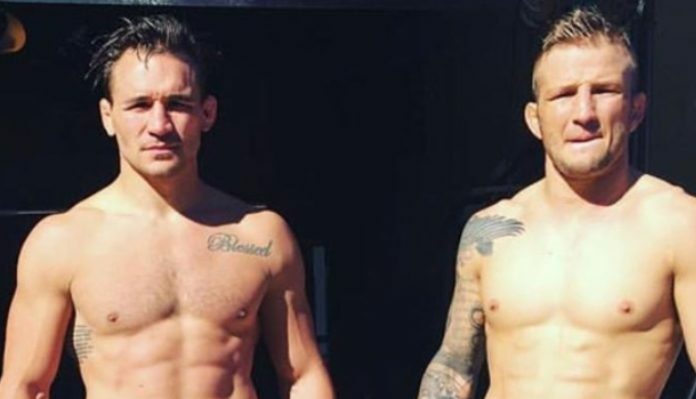 With Chandler’s teammate, the former UFC bantamweight champion TJ Dillashaw’s recent dealings with USADA after an ‘adverse finding,’ it just further aided to Pitbull’s belief. “I am curious because I believe Michael Chandler is doing the same thing [as Dillashaw],” Patricio Pitbull said (via MMA Fighting). “This is a fight between champion versus champion and it needs to be fair. In my opinion, they [work with the same people], they’re training partners, and he could be doing the same thing as TJ. Because imagine TJ’s being tested by USADA and he’s in trouble now possibly for adverse findings — imagine Michael Chandler, who’s not even tested at all, imagine what he could be on. For the 32-year old Chandler, when he faces off with the younger Pitbull brother for the first time next month, he’ll be looking to defend his title for the first time since winning the lightweight title for the third time in his career.